Lifting platforms and telehandlers and forklifts are designed to lift the working personnel to the required height. Such baskets are very useful when carrying out repair work at height, planned inventories, for example, of goods or products. For easy implementation of tasks it is possible to equip the basket with a tool box that can be used as a stand for the tablet, laptop, book for records. 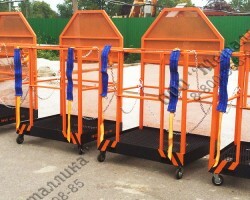 And if you have a platform modified with fitted rollers, it is also easy to move inside the warehouse. 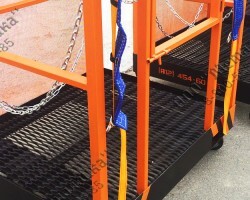 It is possible to manufacture mounting platforms for forklifts, stackers, rich-trucks according to individual sizes and in various configurations. The construction quality is confirmed by GOST-R certificate and 12 months of warranty! Delivery is carried out in all regions of Russia and CIS countries (see the geography of deliveries through the link: Link). If you are ready to provide your own transport for shipment, then the shipment is done by our company and is absolutely free! 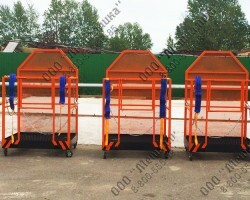 Baskets of standard sizes РП-A and РП-B are in stock. The deadline for making individual baskets depends on production occupancy and is 3-5 working days on average! RESULT: The mounted work platform provides more opportunities to use your equipment and allows you to produce those works that were previously difficult, costly in execution or completely unavailable.